Pour plus d'information à propose de listing, remplissez le formulaire ci dessous pour envoyer un message au propriétaire de listing. 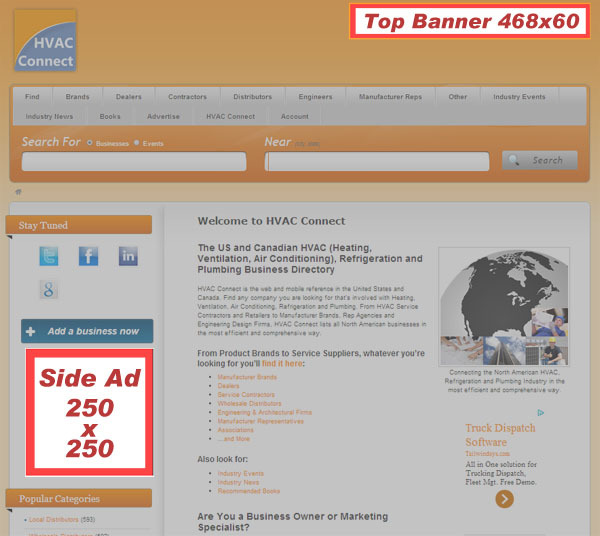 HVAC Connect is the web and mobile reference in the United States and Canada. Find any company you are looking for that’s involved with Heating, Ventilation, Air Conditioning, Refrigeration and Plumbing. From HVAC Service Contractors and Retailers to Manufacturer Brands, Rep Agencies and Engineering Design Firms, HVAC Connect lists all North American businesses in the most efficient and comprehensive way. Are You a Business Owner or Marketing Specialist? Add Your Business… 100% Free! Whether you are a Manufacturer, Contractor, Distributor, Engineer, Architect or other Service Provider… if you’re not on HVAC Connect then where are you? Registration is quick and free and you get to manage your business page yourself. Encourage positive reviews of your company or brand and optimize your visibility. We believe in great content and accessible marketing tools, this is what HVAC Connect is all about. Now it’s up to you to get the most out of it. Une vague de froid, bon pour les affaires? Profitez de la vague de froid, plus de clients à 50% du prix! Restez informé des Nouvelles, Promotions et Concours! Vous faites aussi des affaires en anglais ou hors Québec?